Living: Indoors with a small yard. will do well in apartments with regular exercise. The Affenpinscher is a small dog with a harsh, shaggy coat, and longer hair all over the face. It is a smaller version of a working terrier and therefore is not a delicate dog. It has a square-body, with a deep chest and round head with a pronounced stop. The lower jaw is undershot, protruding below the dog"s short nose. The black eyes are prominent and rounded. The neck is short and arched and the limbs are straight and well boned. The tail is carried high and docked to two-thirds its length. The hairy ears are customarily docked, pointed and erect, however some countries have banned docking of animal"s tails and ears. The coat is usually black or dark gray, but tan and red are also acceptable. The undercoat is slightly curly. The affenpinscher lives up to its name "monkey terrier" in both looks and actions. A terrier at heart, it is busy, inquisitive, bold and stubborn, but it also loves to monkey around, being playful and mischievous. It tends to bark and even climb. Unlike most terriers, it is fairly good with other dogs and pets. This little dog is best with a family that likes entertainment and has a very good sense of humor. 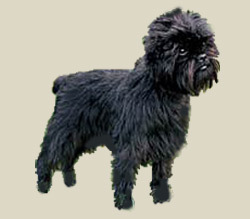 Although an energetic and active dog, the exercise needs of the affenpinscher can be met with vigorous indoor games or romps in the yard, or with short walks on leash. It enjoys playing outside, but it cannot live outdoors. Its harsh coat needs combing two or three times weekly, plus shaping every three months. Shaping for pets is by clipping, whereas show dogs require stripping.